It doesn't get more home-cooked, feel-good, comfort food than this. I mean really, bourbon baked beans, with apples, and bacon. OMG. Here you go, friends. This is happiness on a plate. Now I'm not normally a baked beans kinda gal, but this summer I had the best baked beans EVER and have been dreaming of them every day since. We were at my handsome man's Aunt Val and Uncle Jim's place, and they were throwing a 65th wedding anniversary party for Jim's mom and dad. → Sidebar ← 65th wedding anniversary. Isn't that the most amazing thing you've ever heard?! 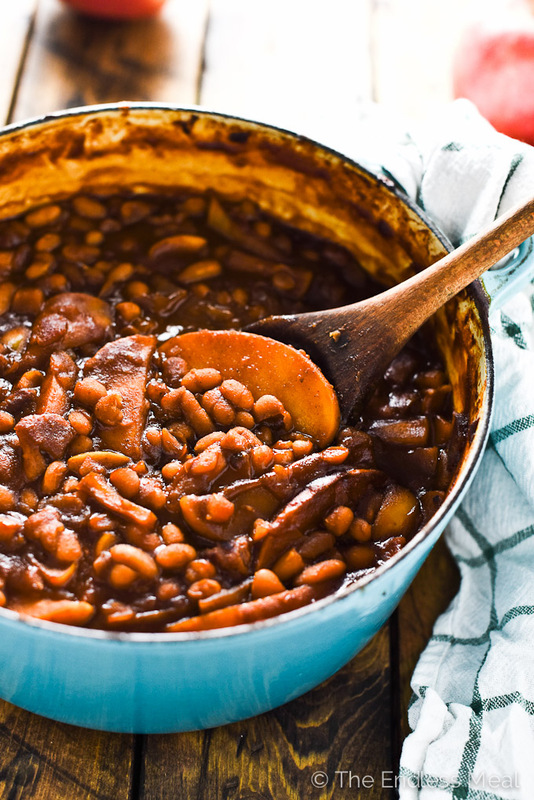 These apple bourbon baked beans are my take on the baked beans I had this summer. I don't think there were any apples in the one I had, but with all the trees brimming with apples I couldn't help myself but add some to the pot. Don't get intimidated by the long-ish looking list of ingredients; these apple bourbon baked beans couldn't be any easier to make. Step 3 → Dig in! I know that a reasonable person would eat these apple bourbon baked beans as a side dish, but I'm happy having a big bowl and calling it dinner. Weird, right? 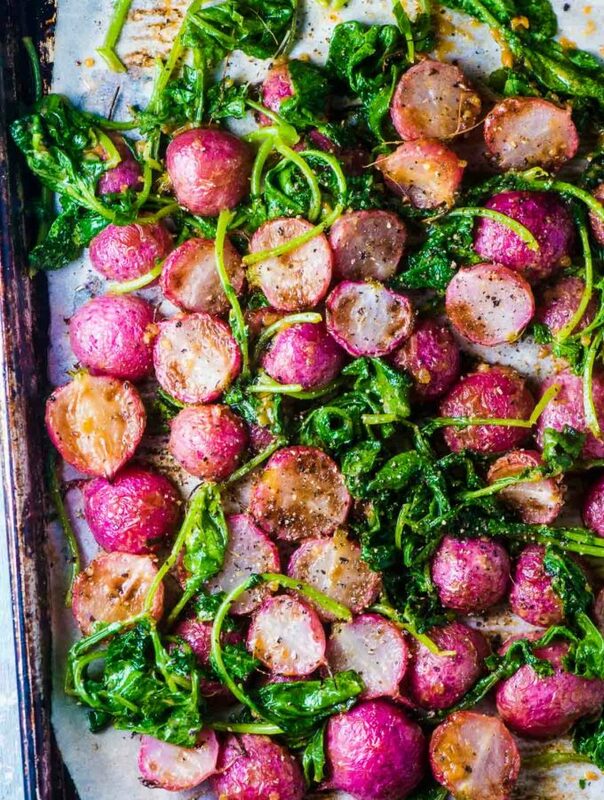 When I was shopping for the ingredients, I threw a bunch of kale into my shopping basket with the plans to eat a big salad and a side of bourbon baked beans. They were good intentions. You know what they say, “the road to delicious bourbon baked beans is paved with …” Wait, that's totally not what anyone says. Ever. Before you guys run away from me and my baked beans delirium, I'm going to go and leave you with these. ??? 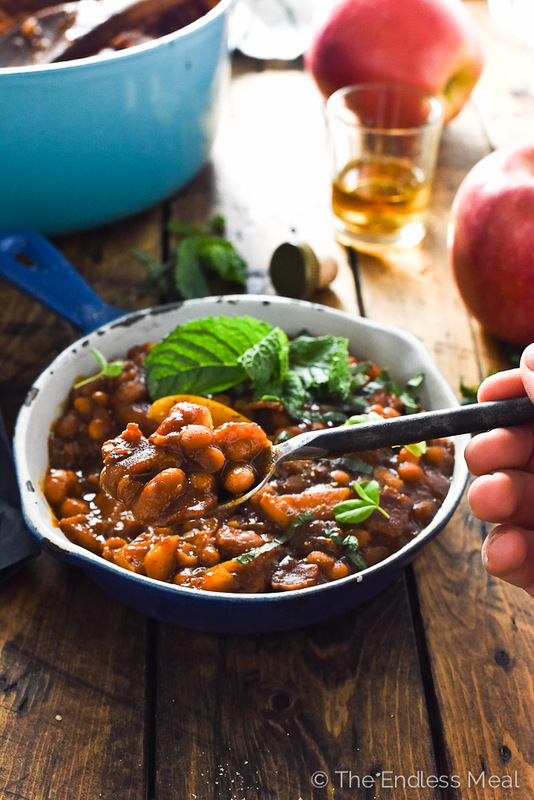 If you make these Apple Bourbon Baked Beans make sure to snap a pic and tag @theendlessmeal on Instagram. I love seeing TEM recipes you create! 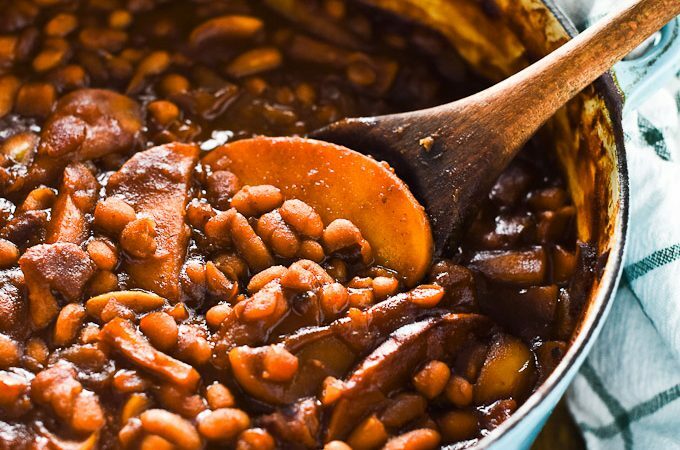 These easy to make one-pot bourbon baked beans are loaded with sweet apple slices for extra delicious beans. They're guaranteed to be a HUGE hit! Add the bacon to a large pot over medium-high heat. Cook for 2 minutes, or until the bacon begins releasing its fat. Add the onion and cook, stirring occasionally, for 8-10 minutes, or until the onion starts to brown, and the bacon is cooked through. Add the bourbon to the pot and scrape the bottom to remove any stuck on bits. Add all the remaining ingredients and give the pot a good stir. Cover the pot and bake in the oven for 45 minutes, or until the sauce has thickened and is bubbly. 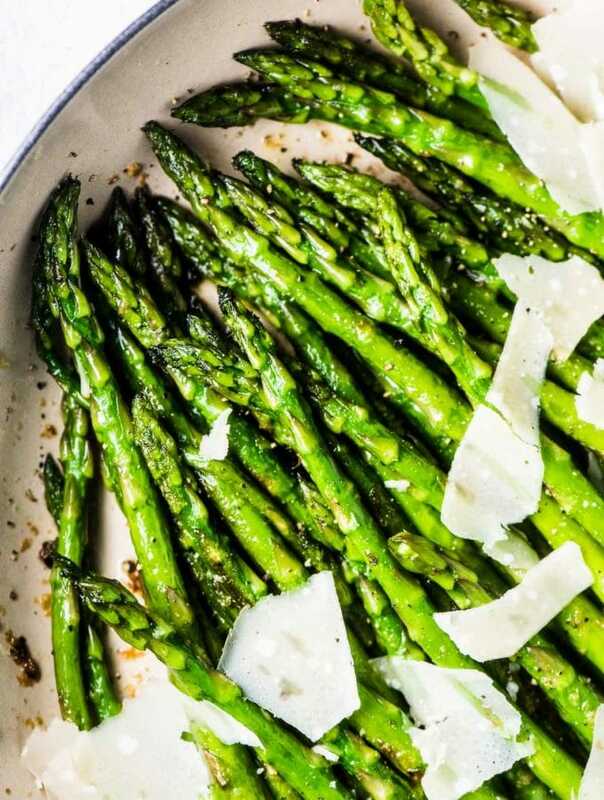 Serve with a sprinkle of black pepper and some chopped mint leaves. Could this be made without the bourbon? Is there something else I could substitute? Looks soo good! I love baked beans and totally digging the combo of apple and bourbon in these! 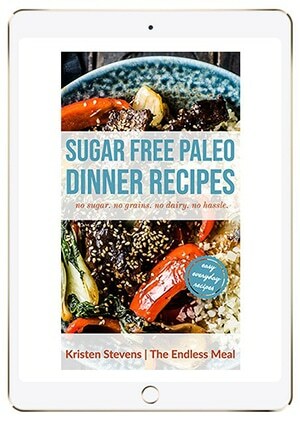 Thanks for sharing, Kristen! I haven’t made it in a crockpot before, but I suspect it would work great. I’ve got a crockpot on my list of kitchen gadgets that I really want, so hopefully you’ll see some more crockpot recipes showing up here soon! I love that you’re with me on the beans for dinner! Go beans!! Oh maaaan! 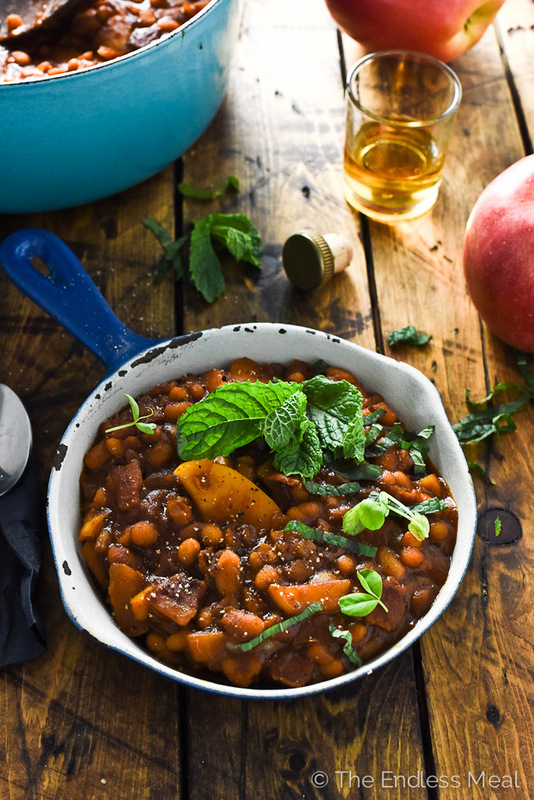 These beans look seriously dreamy with those gorgeous apples! And bourbon too?? Well, twist my arm why dontcha. 😉 These are so coming along to our next cookout! Totally twisting your arm!! Enjoy!! Oh my goodness! A 65th anniversary is amazing!! Love the apple! Such a classic comfort dish for sure!